Do you hand count your drawers at the end of the day, go to deposit the money and realize you've miscounted? If so, it's time to get the help of the machine. Having an accurate picture of the money your business takes in each day is crucial. Not only do you need to know for tax and accounting purposes but also for sales projections. That's where a cash counter helps. While you are likely the person to count all of your cash at the end of the day and take it to the bank, your staff probably balances their own drawers. Retailers with multiple registers and several employees know that not everyone is equally skilled at keeping track of cash. One person might be consistently accurate while another often misses a dime or two. Ideally, you want consistently correct balances. Using a money counter for all of your drawers ensures you get the right amount every time. At the end of the day, all you and your staff want to do is head home. However, putting away items, cleaning the floor and balancing drawers hold you up. As a small-business owner, you probably stay even longer, counting the cash for the entire store. If you find your end-of-the-day routine often takes up an hour or more, you should consider investing in a money counter. This will save you and your employees time by quickly and accurately tallying your profits. 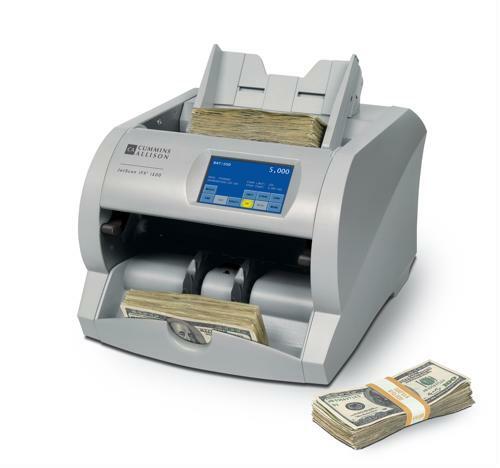 In fact, the JetScan iFX i100 from Cummins Allison can process 1,600 mixed bills per minute! Not only that, but it can process 400 checks each minute.